What’s up with Michael Sim? Michael Sim has always been classed as “Australia’s hottest young golf prospects”, but its gone a little pear-shaped on the PGA Tour this year. Michael Sim started his professional golf career in the US on the Nationwide Tour back in 2006. 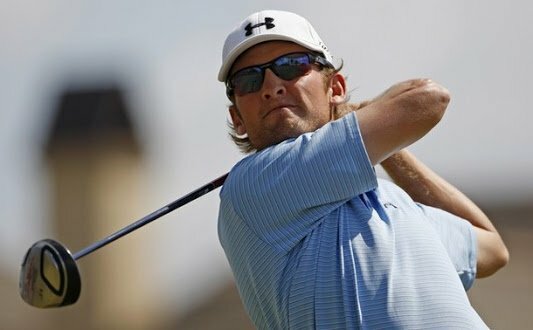 He earned himself a spot in the big time but a stress fracture in the spine, adjusting to the PGA Tour and a stuttering golf game saw him back in the Nationwide Tour in 2009, and facing the task of proving himself again. He did it in a record breaking season. Sim’s 2009 season was extraordinary. He was named Nationwide Tour Player of the Year after a record-setting season which saw him win three times in his first 12 starts and go on to break the Tour’s single-season money record. He finished in a tie for 18th at the US Open playing with Tiger Woods in the final round. He finished number one in all-round ranking, number two in total driving and driving accuracy, number three in birdie average and number six in greens in regulation. He also achieved a high Official World Golf Ranking for a Nationwide Tour player. I’m stressing the numbers here for a reason. They are like chalk and cheese compared to his numbers this year. Michael Sim’s 2011 stats read like a stock exchange report. He’s 161st in driving distance, 122nd in putting and most-tellingly, 181st in greens in regulation. Now yes, someone has to be 181st in greens in regulation, but I would never have picked it to be Michael Sim. As a great iron player, this is very surprising. The 26-year-old Sim showed for a fleeting moment his old form last week at the Crowne Plaza Invitational. His second round under par 67 was his first round in the 60’s since January, and meant he made the cut for the first time in seven tournaments. The weekend went pear-shaped, and finished the tournament 7-over. Sim now has quite a challenge ahead of himself. He has picked himself off the floor a few times already in his career and needs to do it again, starting this week at the Byron Nelson Championship. Michael we still have confidence you can get back to your best.